Cardinal Scale RD2 remote display features quality, stainless steel enclosure, 2.25-inch/57 mm, 6-digit, 7-segment High LED display with 10 levels of brightness, 150 feet viewing range, bi-directional RS232 serial port, versatile mounting bracket, compact overall size, and 3 navigation keys. 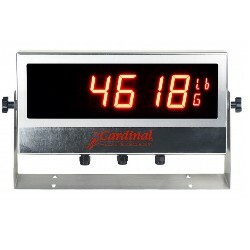 The Cardinal Scale RD2 remote display has a rugged stainless steel enclosure that offers protection from water and dust inherent in industrial environments and a 2.25-inch/57 mm high, 6-digit, 7-segment LED display with 10 levels of brightness that makes measurements highly visible for easy viewing up to 150 feet. A bi-directional RS232 serial port, versatile mounting bracket, 3 navigation keys and compact overall size round out the remaining features.